Riverdale is a neighborhood known for its incredible mansion properties. 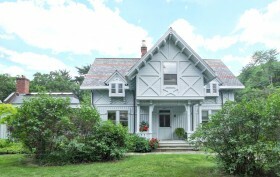 But this one at 4970 Independence Avenue–now on the market asking $3.69 million–really stands out among them all. First there’s the architecture — the home is a fine example of the Stick-Eastlake style, rarely seen in New York City. Then there’s its “utterly fascinating history,” as reported by Cured. Known as the Henry F. Spaulding Estate, it was constructed in 1880 in Riverdale when the area was a private community of country estates. To make way for the development of Wave Hill, the sprawling property was picked up and moved to its current location in 1909. If all that sounds interesting, just wait until you see the interior.